Volume Two of two volume set of Aristotle's works. Originally published in twelve volumes between 1912 and 1954, the Oxford Translation of Aristotle is universally recognized as the standard English version. It is a valuable contribution to studies of Aristotle and is regularly referred to by scholars of all nationalities. Now Princeton University Press makes available the complete works in two volumes. The volumes contain the substance of the original Translation, revised by Jonathan Barnes in the light of recent research. Three of the original versions--Categories, On Interpretation, and Posterior Analytics--have been replaced by more modern translations. A new and enlarged selection of Fragments has been added. A generous index provides indispensible aid to the scholar. Aristotle (384-322 B.C.) taught logic to Alexander the Great and, by virtue of his philosphical works, to every philosopher since, from Marcus Aurelius, to Thomas Aquinas, to Mortimer J. Adler. Now Adler instructs the world in the uncommon sense of Aristotelian logic, presenting Aristotle's understndings in a current, delightfully lucid way. He brings Aristotle's work to an everyday level. By encouraging readers to think philosophically, Adler offers us a unique path to personal insights and understanding of intangibles, such as the difference between wants and needs, the proper way to pursue happiness, and the right plan for a good life. 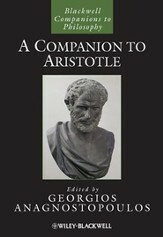 The Blackwell Companion to Aristotle provides in-depth studies of the main themes of Aristotle's thought, from art to zoology. 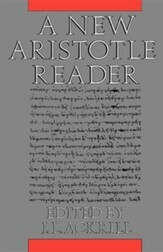 Comprised of 40 newly commissioned essays from leading experts, this companion covers the full range of Aristotle's work, from his 'theoretical' inquiries into metaphysics, physics, psychology, and biology, to the practical and productive "sciences" such as ethics, politics, rhetoric, and art. 672 pages. 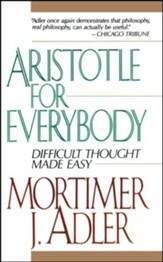 In a single volume that will be of service to philosophy students of all levels and to their teachers, this reader provides modern, accurate translations of the texts necessary for a careful study of most aspects of Aristotle's philosophy. In selecting the texts Professor J.L. Ackrill has drawn on his broad experience of teaching graduate classes, and his choice reflects issues of current philosophical interest as well as the perennial themes. Only recent translations which achieve a high level of accuracy have been chosen; the aim is to place the Greekless reader, as possible, in the position of a reader of Greek. As an aid to study, Professor Ackrill supplies a valuable guide to the key topics covered. The guide gives references to works or passages contained in the reader, an indication of their interrelations, and current bibliography. J.L. Ackrill is Professor of the History of Philosophy in the University of Oxford. He is the author of Aristotle the Philosopher and Aristotle's Ethics and translator of Aristotle's Categories and De Interpretatione. Aristotle's Rhetoric is known as one of the finest works on the classical concept of rhetoric--a subject's own style or forms of expression. This course is an accompanied 'tour' during this book, conveying in simpler terms what Artistotle's arguments are. Focusing on the content rather than the technique of rhetoric, this course will follow Aristotle's concern with the 'what' of communication. 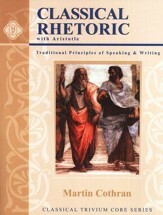 Following the chapters of Rhetoric, open-ended questions focus on questions that may be answered from the book and critical thinking questions. Quotes, selected readings, weekly writing assignments (research and evaluative) and Latin translations are all included, helping students to gain a thorough and unique understanding of this classical tradition. 175 non-reproducible pages, softcover. Answer key sold separately (stock # 636452). In one of the most perceptive and influential works of criticism in Western literary history, Aristotle examines the literature of his time, describing the origins of poetry as an imitative art and drawing attention to the distinctions between comedy and tragedy. This new translation of Thomas Aquinas's most important study of Aristotle casts bright light on the thinking of both philosophers. Using a new text of Aquinas's original Latin commentary (Rene-Antoine Gauthier's Leonine edition of 1984), Robert Pasnau provides a precise translation that will enable students to undertake close philosophical readings. 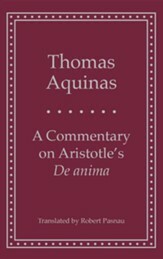 He includes an introduction and notes to set context and clarify difficult points as well as a translation of the medieval Latin version of Aristotle's De anima (On the Soul) so that readers can refer to the text Aquinas had at hand. 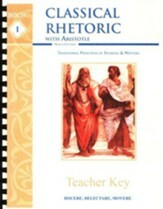 This teacher key accompanies Memoria Press' sold-separately Classical Rhetoric with Aristotle student book. This key provides the questions asked, as well as the answer in italics. Lesson page numbers are referenced for the exercise set (not individual answers). Comb-binding.